Megalosaurus was a carnivore (meat-eater) that lived in Europe (including France Portugal, and southern England), during the middle Jurassic period, between about 181 to 169 million years ago. Part of Megalosaurus bone was discovered in a quarry in England in 1676. Although it was correctly identified as the femur from a large animal, but it was wrongly thought to be the thigh bone of a giant human! Further discoveries were made in the 19th century, starting from 1815 and acquired by William Buckland. In 1818, French anatomist, Georges Cuvier, visited, and realized the bones were from a giant lizard-like creature, and thus in 1824, Buckland reported and named the animal in a report entitled "Notice on the Megalosaurus or Great Fossil Lizard of Stonesfield". 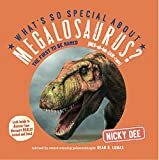 Megalosaurus was in fact the first dinosaur named - in fact it had its name, even before the word dinosaur existed - the term "dinosauria" was only coined by Sir Richard Owen in 1842. Early reconstructions of Megalosaurus (such as the one found at Dinosaur Court) tend depict the animal as a heavily-built quadruped (to add to the confusion, some early literature refers to all dinosaurs found in Europe as Megalosaurus). We now know however that Megalosaurus was a bipedal carnivore with relatively short fore limbs. In addition to fossils of Megalosaurus bones, scientists have also discovered fossils of trackways (footprints) made by the animal. A replica of one such trackway can be found on the lawn outside the Oxford University Museum of Natural History. European Dinosaurs - Megalosaurus lived in Europe (including England, France, and Portugal). Megalosaurus was a genus of dinosaur. "Megalosaurus" means "big lizard". It was the first dinosaur named, its name being chosen by William Buckland in 1824. Megalosaurus was a member of the Saurischia ("lizard-hipped") order of dinosaurs. What this means, is that although Megalosaurus was not closely related to lizards, it did have similarly shaped pelvic bones. 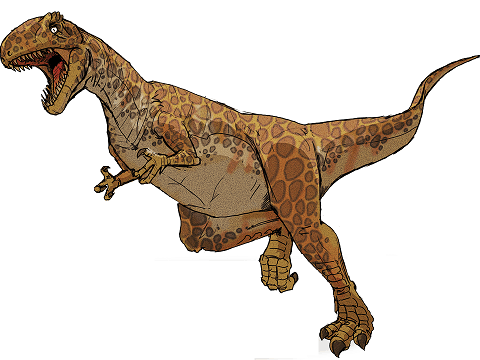 Megalosaurus was a Theropod - a member of a group of related bipedal dinosaurs that included the ancestors of birds (although Megalosaurus was not itself an ancestor of birds). Megalosaurus lived between about 181 million years ago and 169 million years ago, during the Jurassic period. Megalosaurus was a carnivore (meat-eater). Megalosaurus was about 30 feet (9 meters) long. Megalosaurus weighed about 1 ton. Megalosaurus was the very first dinosaur ever found in fossils. The discovery of this "Great Lizard" introduced the world to prehistoric monsters that once roamed the earth. Vibrant images, accompanied by colorful maps, fun facts, and engaging text supported by Smithsonian experts, transports readers back in time. Megalosaurus was the very first dinosaur to be named, identified in 1824 from bones including a portion of a jaw with large teeth. Discover how fast it could move with the Speed-o-Meter, how terrifying it was on the Scary Scale, and which of today's animals it most resembles. "Simple text and illustrations present megalosaurus, how it looked, and what it did"--Provided by publisher. Describes the physical characteristics, natural environment, and habits of Megalosaurus, a huge, two-legged, meat-eating dinosaur. CollectA's replica of the Megalosaurus is lifelike in every detail, down to its wrinkled hide and the bony ridges above its eyes. The first fossil of this dinosaur was a bone unearthed in Oxfordshire in 1676. Gradually, more discoveries were made and studied and in 1921, scientists began calling the creature ''Huge Lizard,'' which is the origin of the name. The Megalosaurus was carnivorous and walked on its hind legs, using its tail for balance. It lived approximately 201 to 145 million years ago. This beautifully sculpted, collectible figure from our Prehistoric Life Collection measures 5.3''L x 3.5''H. Each prehistoric figure in our collection has been approved by archeologist Anthony Beeson, a well-respected expert in paleoimagery. All CollectA models are individually hand crafted to the highest standards and made with the finest and safest phthalate-free, lead-free materials. Create a natural world in miniature with high quality toy replicas from CollectA. Our mission is to educate collectors and to provide the greatest opportunity for creative play. 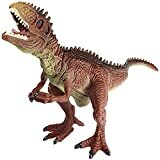 PRODUCT SPECS: CollectA's Metriacanthosaurus measures 6" L x 3" H and is realistic and lifelike in every detail with longer dorsal spines than that may have formed a slight ridge on its back. CollectA is known as one of the world's leading manufacturers of the finest scaled replica collections. When they play with these replicas, children learn more about the animals and their environment, while having fun at the same time. Role play encourages the development of your child's imagination and creativity. All CollectA models are individually hand crafted to the highest standards and made with the finest and safest phthalate-free, lead-free materials. Create a natural world in miniature with high quality toy replicas from CollectA. Our mission is to educate collectors and to provide the greatest opportunity for creative play. Miniture Dinosaur displayed at Natural History Museum in UK. Ideal gift for children or adults too. 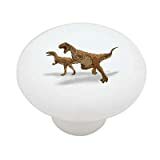 This 6pc hand-crafted, hand-painted Megalosaurus puzzle stands up to brighten any room. As beautiful to look at as it is fun to put together! Great intermediate puzzle. Because the pieces are double-sided, this puzzle is equivalent to a 12pc puzzle, since you don't know which side is up. Hand-crafted & hand painted with child-safe paints. Made from plantation-grown rubberwood, an environmentally-friendly hardwood. IF NO COLOR CHOICE SPECIFIED BLACK DECAL WILL BE SEND. JUST SEND US A MESSAGE WITH COLOR CHOICE RIGHT AFTER THE PURCHASE. Decorate your home with beautiful and affordable vinyl decals for your walls. It's easy to apply and really makes a room look elegant. Vinyl decals will completely change the way your accommodation looks. It's only one solid color, second color inside is the color of your wall or any other surface. APPLICATION AREA Decals can be applied to any clean, smooth and flat surface. Put them on your walls, doors, windows - anywhere you want! Application areas: Walls, Windows, Tiles, Floors, Doors, Furniture, Electrical items such as refrigerator, TV, washing machine, Computers, cell phones, notebook, ipad etc., Store Front and many other surfaces. Also this graphic can be applied to cars. It is much faster, cleaner and easier than painting. !OUR MATERIAL Each decal is made of high quality, self-adhesive and waterproof vinyl. We use American Vinyl for our stickers. Such vinyl is easily applied and will look excellent for 7 years on any surface. You can remove vinyl without damaging the surface or making it dirty. The surface will be clean after removal. PRODUCT DETAILS Sizes are usually from 22" X 22" to 22" X 35" depending on the design. -Our decals are fully removable. 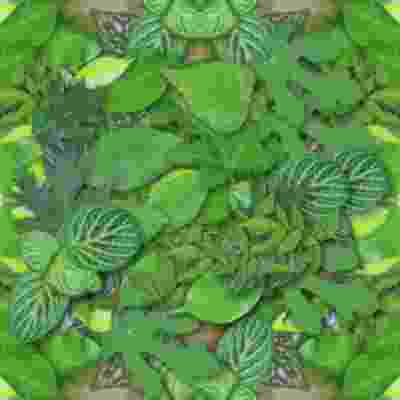 -Mirror image is possible. Just say it when you are ordering If this size is inappropriate for you, you can contact us and provide your dimensions. If we are able to make it we will tell you the price and create listing for you. Please choose 1 color you want from our color chart or just make a note in the PayPal message box or write in order note about your color choice when you are paying for item. Otherwise this decal will be shipped in BLACK GLOSSY color. ***COLOR CHOICES: Glossy Black, Matte Black,Red,Burgundy, Baby Blue, Royal Blue, Navy Blue,Baby Pink, Hot Pink, Apple Green, Grass Green, Dark Green, Yellow, Orange, Lilac, Purple, White, Brown, Beige, Teal, Gold, Metallic Silver.